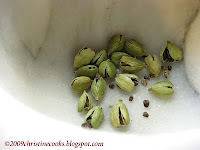 I especially love using whole seeds that have been extracted from their cute green pods. When I bought plums last week, I made a gluten-free plum and cardamom galette, which turned out fabulously, thank you very much. 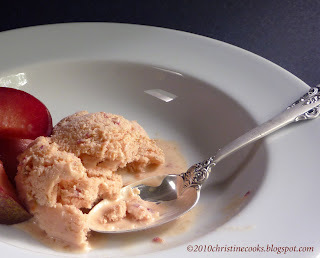 I saved some of the sliced plums from that recipe to make ice cream and when it came to deciding on a recipe, cardamom, this time using whole seeds, just seemed like the right flavor combination. Plums are in season right now so get them at their peak. If you can, source them organically and locally. Combine the sliced plums with the first measurement of Splenda or sugar and let sit for 15 minutes to juice. Using a large saucepan, simmer plums over medium heat until they have cooked for at least 5 minutes. ** Remove from the heat, cool 5 minutes then purée in a food processor. Set aside. Meanwhile, heat the milk, cardamom seeds and vanilla in a large saucepan until bubbles form around the edge of the pan. Remove from the heat and allow to steep for 20 minutes to 1/2 hour. Remove the vanilla pod and strain the milk mixture through a fine mesh sieve. Put the milk back into the saucepan. You can scrape the vanilla seeds into the milk at this point if desired. Beat the egg yolks with the remaining Splenda/sugar blend or 1/2 cup sugar until the yolks are a pale yellow and have thickened so the mixture falls in ribbons from the beaters. Gently whisk 1/3 of the warm milk into the eggs until combined then whisk the egg mixture back into the milk and heat over medium low, stirring constantly, until it coats the back of a wooden spoon and your finger leaves a mark when run across it. Remove from heat and allow to cool 5 minutes. Gently whisk the puréed plums into the custard****, pour into a large glass dish or pitcher and refrigerate for at least 4 hours until thoroughly chilled (overnight is best). Just before processing, stir the cream into the custard until blended, then process according to the manufacturer's instructions of your ice cream maker. 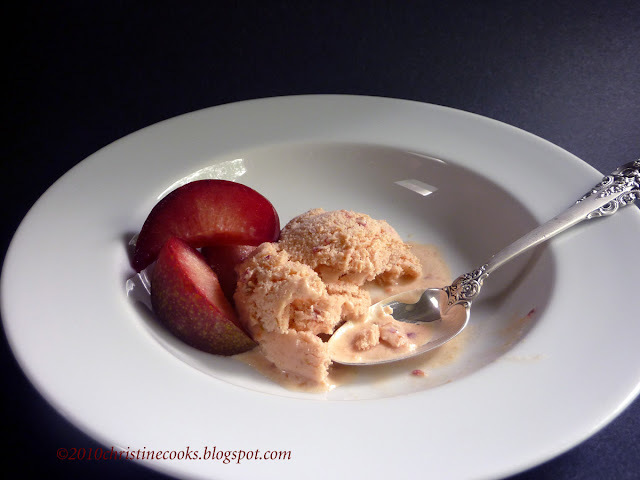 * I used a combination of red and yellow plums that I had leftover from this recipe. They were sweetly tart, which I like. The amount of sugar you use for the ice cream will depend on the tartness or sweetness of the plums you use. ** I learned the hard way that some fruits must be cooked to reduce their acid affect on dairy. I didn't do this with the first batch I made which resulted in a curdled custard. So, please, stew your plums. *** I have also learned through trial and error that the addition of sugar to the beating of the egg yolks is pretty much paramount to ice cream success. I'm not liking that this is true but I'm afraid it is. So I use the least amount of Splenda-sugar blend that I can get away with. It works for me and adds just a small amount of sugar per serving. As always, if you are not a Splenda user like I am, go for the sugar rush. I will not judge you. **** Alternatively, you can add the plum purée to the ice cream while it is processing, resulting in a more ribboned effect. I love cardamom too! I think it somehow sweetens flavors without add more sugar. I find your: I'm not liking that this is true but I'm afraid it is. ... interesting and amusing at the same time. Thanks for cook's note #2: I didn't know. Lovely color! I also love cardamom & this ice cream looks the best! I also love the colour of it! I found out about the fruit acid-dairy thing when I made persimmon flan. You have to cook the persimmon first to prevent the dairy from curdling. I didn't know that about plums until the custard curdled and I had to throw out the whole batch. Thank you Katie. Ice cream certainly may be made by hand and frozen in trays, but the process takes so much longer. Get an ice cream maker - you'll be glad you did. Thanks Sophie. Good to hear from you. You've been on vacation? 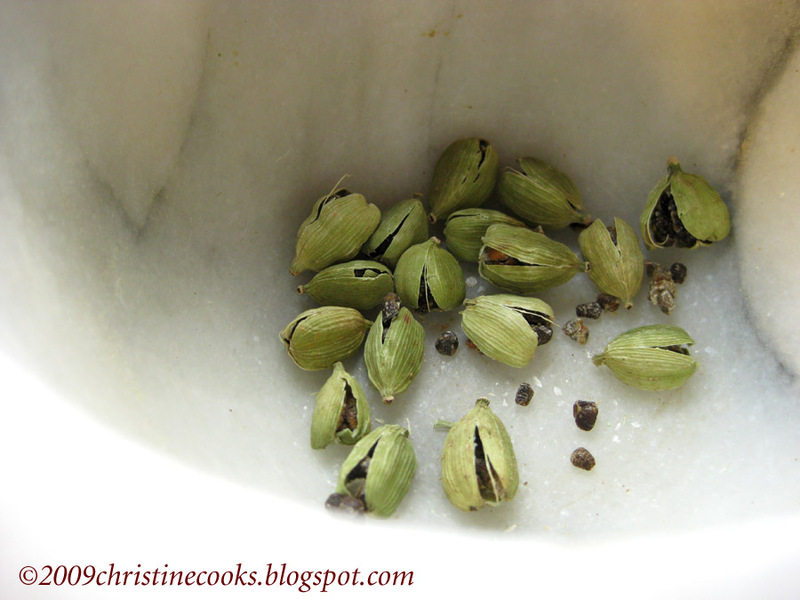 i also love cardamom - i even put crushed pods into my coffee... it's a relatively new addiction (about 3 years), but it is essential in sweets, as you say! Ooooh! Crushed cardamom in coffee? I will definitely try that! Thanks, Johanna. That is a beautiful photo, Christine! I adore cardamom as well. In fact I have been wanting to make a plum and cardamom coffee cake. Thanks for the delicious reminder. Susan, Be sure to post that plum cardamom coffee cake! Sounds delicious. Thanks Mary. See you at Ruby Tuesday. Yes, my husband & I went on a biking holiday again for 10 days. It was lots of fun! I am on a diet now, gluten free etc. I have allready lost 8 kg!! Hi Sophie! Going gluten free was the best thing I've ever done for myself. Good for you!